This was a recipe that I originally saw on Pinterest a while back and had to try! I love fresh fruit, especially during the summer when its so hot & humid outside, so this healthy salad was right up my alley! Plus it gave me the opportunity to use a GORGEOUS new Tiffany crystal bowl that we received as a wedding present (thanks Trevor & Barb!!). For the salad, I had quite an abundance of fresh organic berries in my fridge, so I used 4 different varieties along with organic mango but you can really get creative and use any combo of fruit that you'd like. Some great additions to mix it up might be pineapple, or peaches! The dressing that I made is an agave, lime, mint dressing that is beyond easy to whisk together and really adds a refreshing taste to the salad; it compliments all of the different fruits without being the slight bit overwhelming. At the last minute, I threw in one tablespoon of whole flax seed to add a bit of a crunch. This is such a light summer salad, perfect to bring to a BBQ as a healthy alternative to most other fattening salads! Hope you enjoy! Prepare quinoa according to manufacturers directions. Once cooked, remove from heat, and set aside. Allow to cool to room temperature. Once cooled, combine all fruit w/ quinoa in a large bowl. Add in flaxseed, and set aside. In a small bowl whisk together the lime juice, agave nectar, and chopped mint. 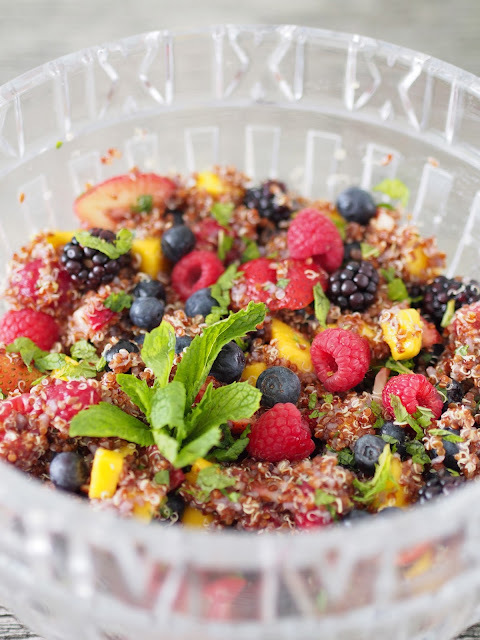 Pour over quinoa/fruit mixture and gently toss to combine. This salad can be served immediately, or refrigerated and enjoyed later.